Kards by Katie Kreations: Time To Celebrate! Hi All! 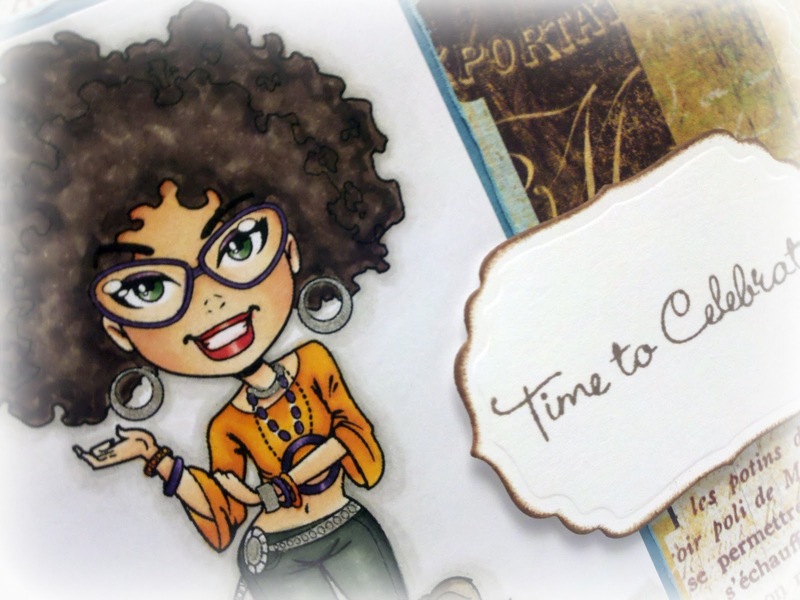 I've got a 'funky' little card to show you! The challenge over at Stamp Something is to do something Funky and that truly was the jumping off point for this card :) First off I've used a Kenny K image named Bling Baby from the new Glam Gang set 2 (grab them here)- it just screamed Funky to me- and I have to admit I own a scary amount of Kenny K digi's but I just can't resist them...I love their urban feel! To keep the urban feel I had some DP paper from Basic Grey in mind, the Wander line, with it's kind of cityscape design and used those more subdues colors throughout- including some of the new lines from My Minds Eye that matched perfectly. For the Kenny K challenge they want there to be something that starts with the letter R on the card so I used my Rectangle Nestabilities to cut my image out and then threw in a couple of Rhinestones as well for good measure. My style is usually a little more bright but I have to say I really do love this card! Here's a close up of the image that I colored with my Copics- I was a little worried about the hair but it turned out just like I pictured in my head so I'm happy with it! OH I LOVE IT TO!! you have colored this just perfectly.. and I love the DP..Great job with this weeks challenge.. 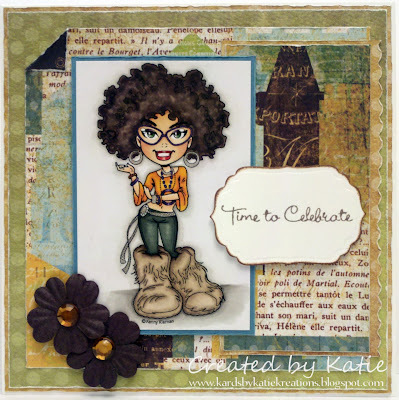 Thanks for joining us at KKKG this week..
Oh wow I love this image,you make a stunning card!! WOW! The image is COOL! Love the coloring! Fabulous card! Thanks for joining us at Do You Stack Up. Stunning card. Your colouring is excellent and your dp is definitely in keeping with the 'urban' feel. Thanks for joining our 'digi' challenge at Totally Papercrafts this week. Such a fun card! Thanks for joining in this week at DYSU. Hope to see you next time! Hello Katie honey! 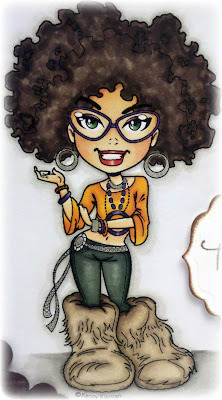 Wow, this is such a cool card - I love sassy and I love your sassy card! Ha- this image is adorable and I think your hair came out fab!! love it - Thanks for playing along with us at Paper Sundaes! Now that's what I call funky, just perfect. This is brilliant I love the colour combo and you have gone for one of my fav Kenny images I LOVE it. Thank you for joining us at Kenny K and good luck. What a fun card, love that image! Thanks for playing along with us at Paper Sundaes! She rocks!! LOVE her so much! I of course would love to know what copic colors you used. Katie, You are amazing! What a sassy image she is! Love this card, gorgeous coloring! What a great card - love your coloring. You background layers are terrific, as well!